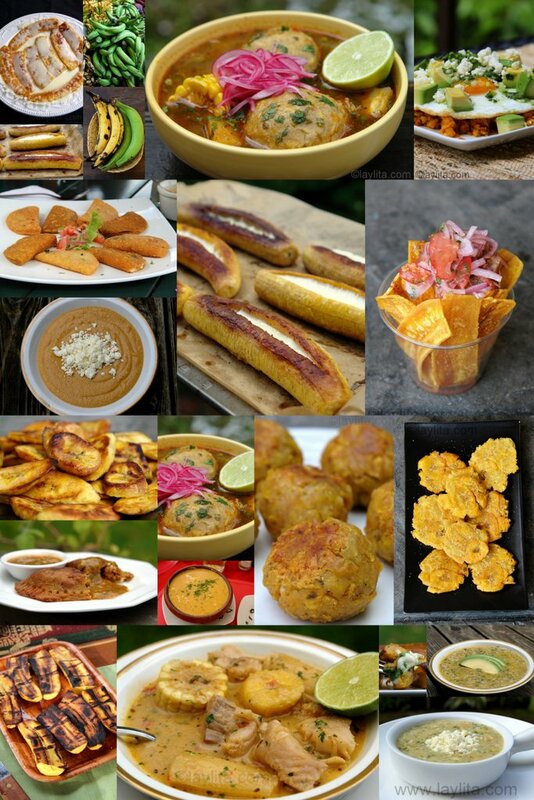 This is my collection of delicious Latin American plantain recipes, made both with ripe plantains (maduros) and green plantains (verdes). Plantains are often mistaken with bananas, and while they’re part of the banana family, they are very different. The main difference is that they must be cooked before being eaten; this is due to the fact that they are starchier than bananas. Plantains are a must-have ingredient for many popular Latin American dishes and can be used in both savory and sweet recipes. Green plantains, also known as platano macho o just verdes, are used in a variety of savory dishes, from appetizers to soups. Ripe plantains, sometimes called just maduros, are used in both savory and sweet dishes. 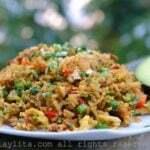 Some plantain dishes, such as chifles or thin green plantain chips are very simple and straightforward. Other plantain dishes, such as caldo de bolas or plantain dumpling soup or green plantain empanadas, require a little bit more work, but are completely worth it. Plantains are one my favorite ingredients to cook with, the first thing I ever learned to cook by myself were fried ripe plantains. There are different varieties of plantains. In Ecuador, we have a white variety and the classic yellow plantain, you can tell the difference by looking at the plantain flesh. There is also a variety of plantain called avocado plantain, this one is thicker and smaller than the usual long plantain – and is used to make the extra-large patacones or tostones (thick fried plantain chips). Plantains are extremely versatile and can be cooked in so many different ways: you can fry them, boil them, bake them, mash them, steam them, and grill them. 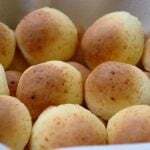 They can be used to make empanada dough, dumplings, patties, soups, desserts, and more. You can use them as is, but you can also find plantain flour to use as a replacement for regular flour. 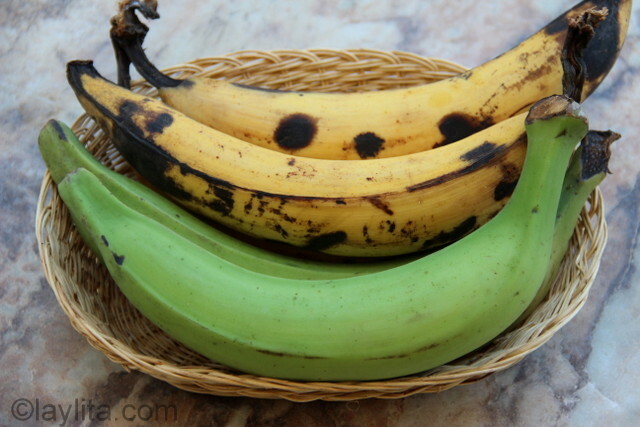 In some cases you can use green bananas, but they must be really green, to replace green plantains. There are some traditional recipes that use green bananas as a first choice, but since it is sometimes hard to find these in the US, you can replace them with green plantains. However, ripe bananas cannot be used as a substitute for ripe plantains as their consistency is very different. As I’ve been exposed to more Latin American cooking, I’ve noticed that there are many similar plantain dishes in Latin America, and probably Africa as well, but the name of dish and exact preparation varies from one country or region to another. Chifles: Chifles, also known as mariquitas, chicharitas, platanutres or plataninas, are thin fried green plantain/banana chips. 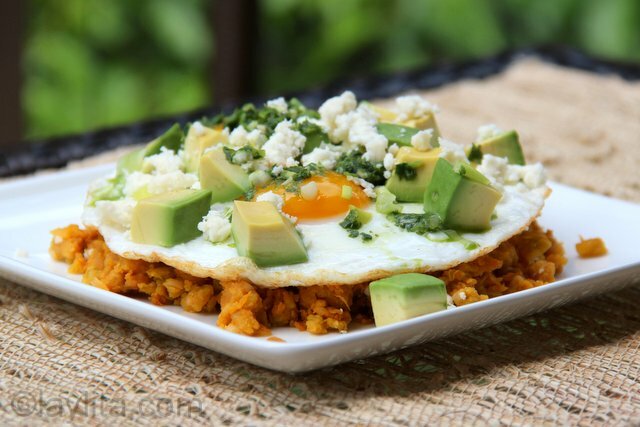 Patacones: Patacones, also known as tostones, are a popular Latin American appetizer or side dish of thick green plantain chips. 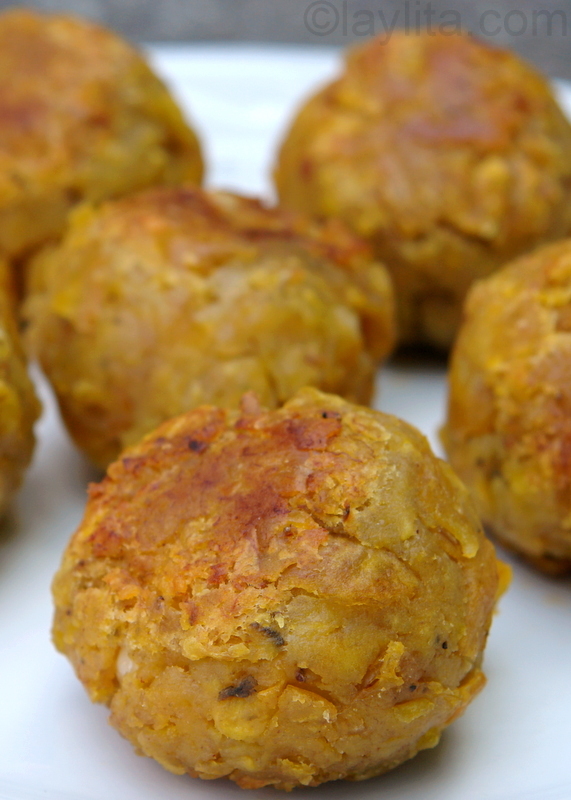 Bolon de verde: Bolones de verde are Ecuadorian green plantain dumplings stuffed with cheese, chorizo or chicharrones and fried until crispy. Empanadas de verde con queso or green plantain empanadas: Empanada dough made from green plantain dough and stuffed with cheese and onions. Majado de verde or mashed green plantains: Majado de verde is a green plantain mash made with green plantains, onions, garlic, and achiote. Majado is served with fried eggs and cheese slices. 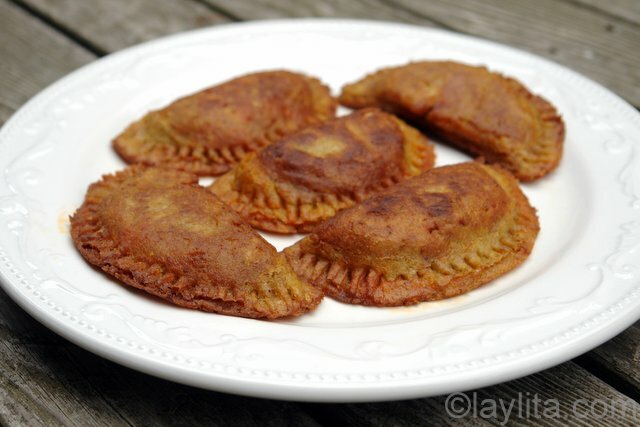 Tortillas de verde: Recipe for Ecuadorian green plantain patties stuffed with cheese, also known as tortillas de verde, made with a dough of green plantains, a cheese filling, and cooked on a griddle or frying pan. 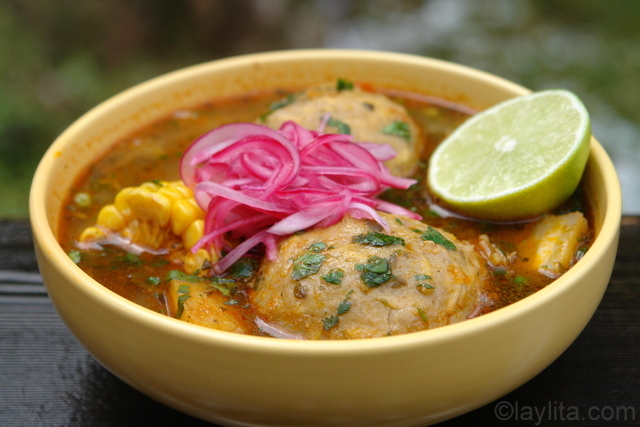 Caldo de bolas de verde or green plantain dumpling soup: Caldo de bolas is a typical Ecuadorian soup of green plantain balls or dumplings stuffed with meat and served in a delicious broth with corn and yuca. 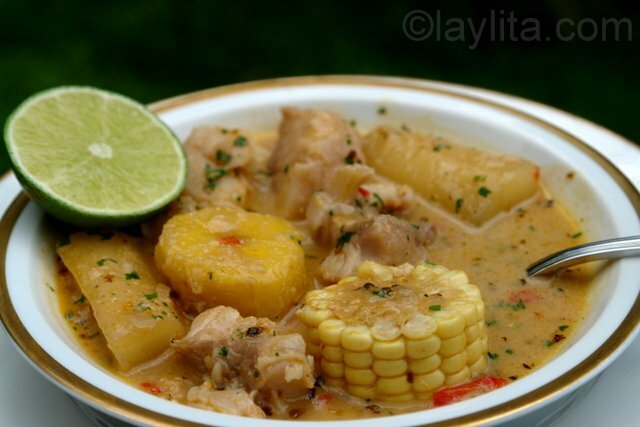 Biche/Viche de pescado: Biche de pescado, or viche de pescado, is a traditional Ecuadorian soup made with fish, peanuts, yuca, sweet plantains, corn, and other vegetables and spices. 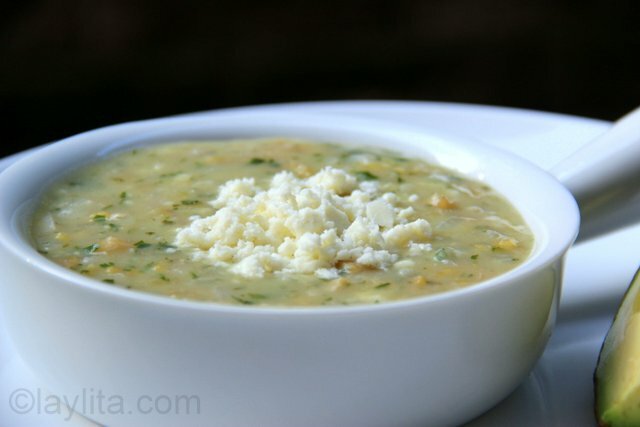 Repe: Repe is a creamy soup made with green bananas (or green plantains), onions, garlic, milk, cheese and cilantro. 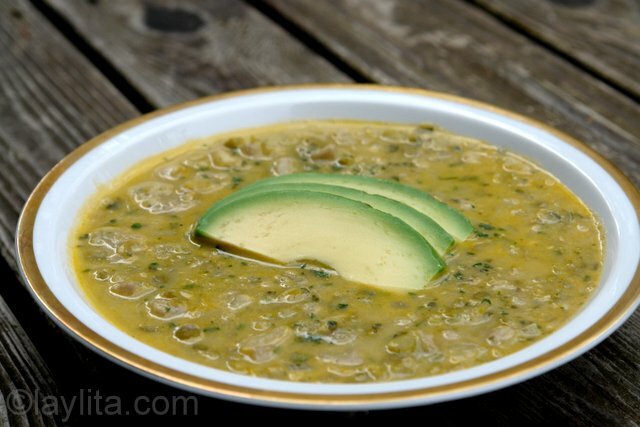 Arvejas con guineo: Arvejas con guineo is a typical Ecuadorian soup made with green bananas (but you can also use green plantains), peas, onion, garlic, cumin, achiote, cheese and cilantro. 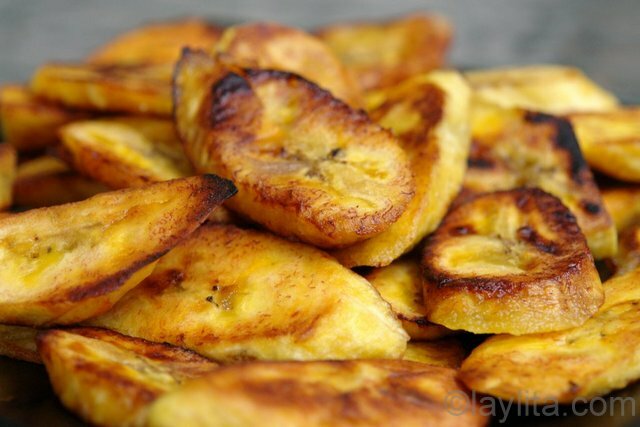 Fried ripe plantains: Traditional recipe for fried sweet ripe plantains – a must-have side dish for so many Latin dishes. Platanos asados con queso: Easy recipe for baked plantains stuffed with cheese. Served with a spicy aji criollo or cilantro salsa. 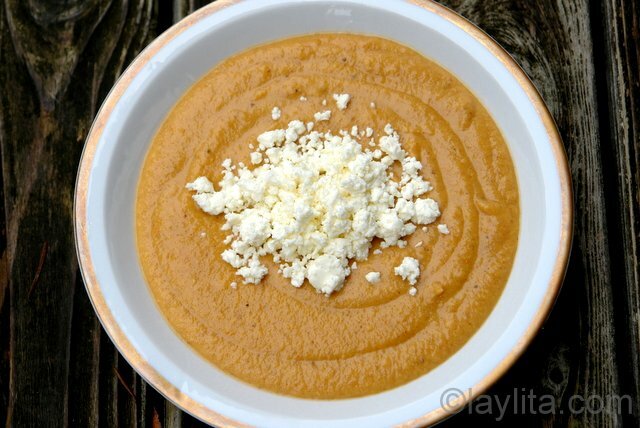 Ripe plantain puree: Puree made with ripe sweet plantains, milk, butter, onions, garlic, cumin, achiote, chili pepper, salt and pepper; makes a great side dish from meat dishes. 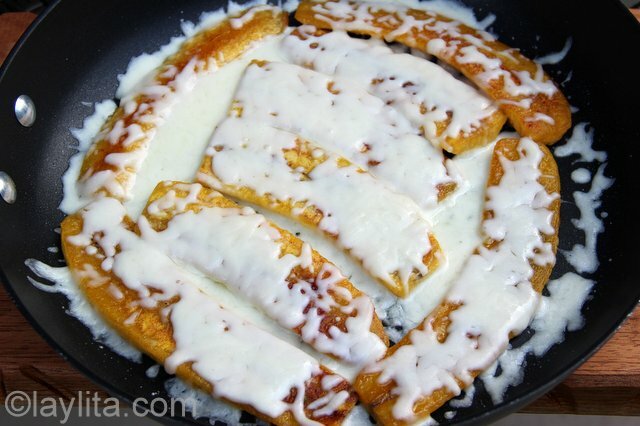 Skillet fried plantains with cheese: Easy recipe for fried plantains with melted cheese, made with sweet ripe plantains topped with grated quesillo or grated mozzarella. Canoas de plátano con tocino y queso: Recipe for bacon and cheese stuffed ripe plantains made with baked ripe plantains filled with crispy bacon, grated mozzarella and queso fresco. Served with spicy aji criollo hot sauce. 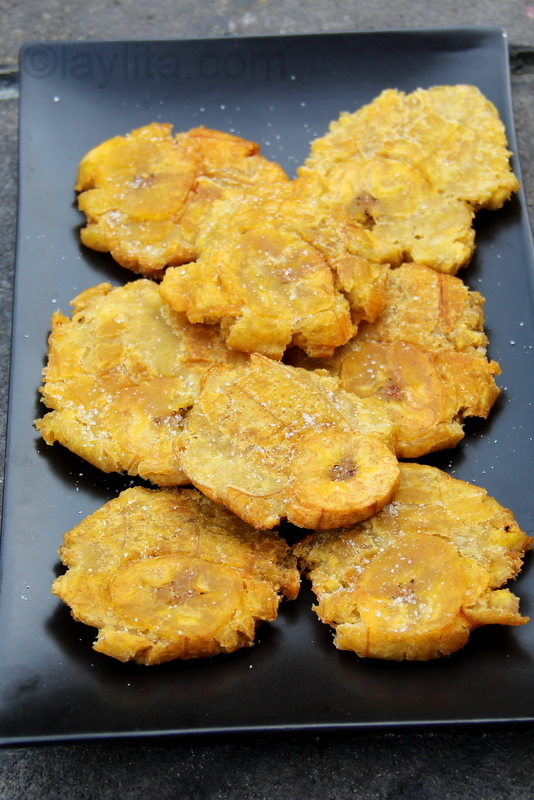 Here are some more Ecuadorian plantain recipes. 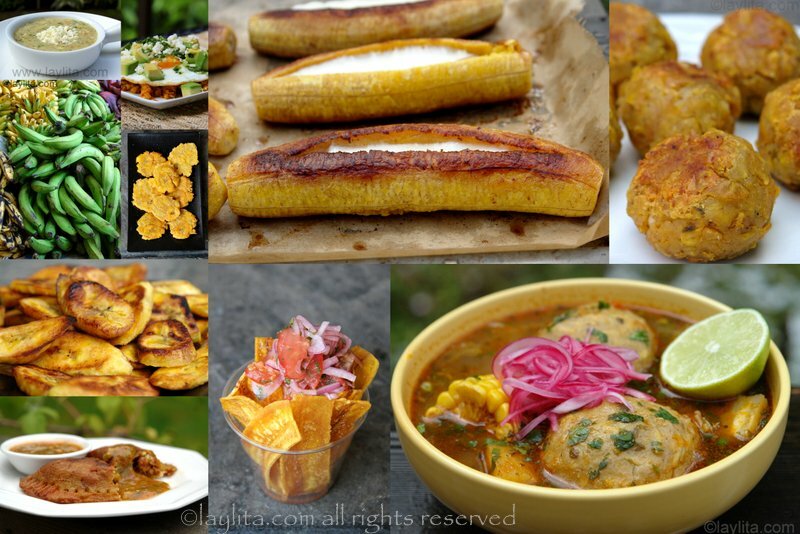 For more plantain deliciousness try these recipes from my favorite Dominican food blog. Thrilled to have found your site! It’s fantastic! Grateful for this site. 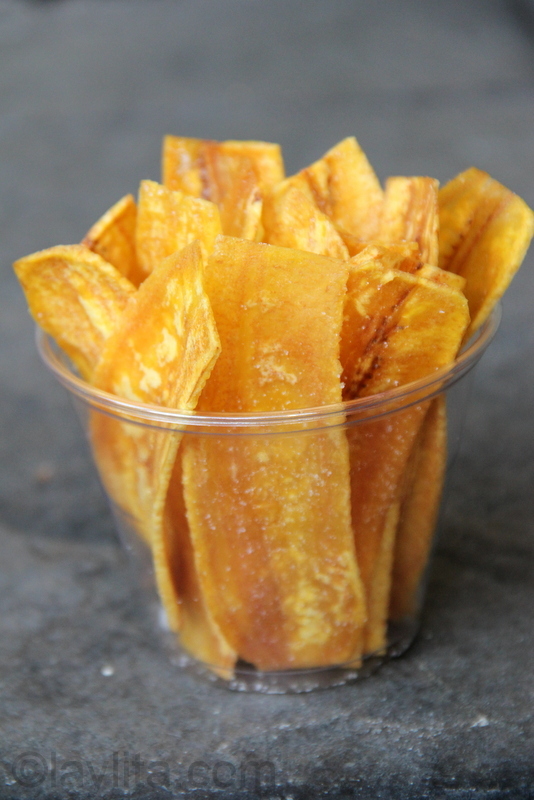 Always wondered what I could do with green plantains especially…found ideas here. 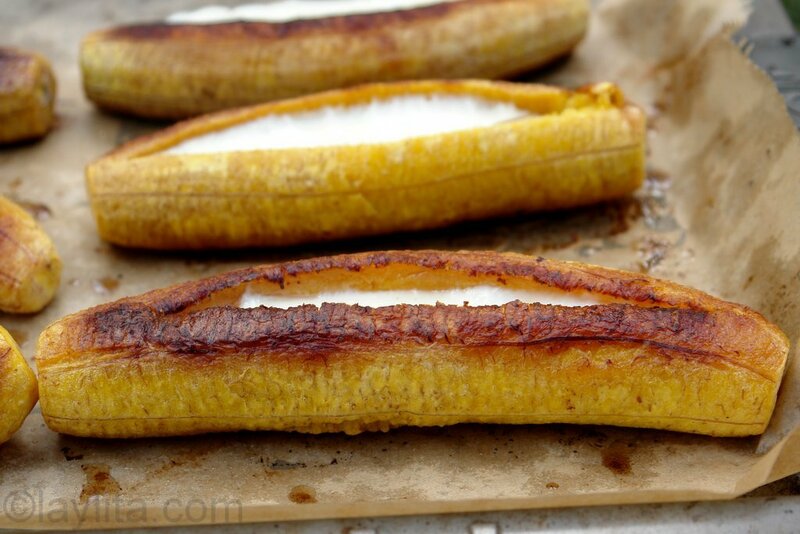 Not a fan of ripe plantains but the ideas here inspire me to try a thing or two. Thanks! This is great. I am wondering if you have any info on how to make Tigrillo from the El Oro region of Ecuador. It is sauted plantains with egg. I was told it was traditional for the Zaruma / Puerto Velo area. Follow up: is this the same as the Majado de verde? It seems similar. It’s very similar to majado, but with tigrillo you add egg (lightly beaten), milk and cheese to the majado when it’s still on the stovetop and let it cook (stirring) until the egg is cooked and the cheese is melted. I was looking for plantain inspiration. I’ll look no further. I recently visited Ecuador and fell in love with the fried bananas. But of course, the people more! Wonderful, hospitable people! While there I spoke with a national who said that I needed a certain variety of banana and wasn’t certain I could find them here in the United States. Well I found plantains at our local grocery store (not sure it is the right variety, but it did say “good for frying and baking” on the package. So I went looking for a recipe and found your website. I cannot, however, access the “fried ripe plantain” recipe. Is it no longer available? Would love any help! Thank you so much for your plantain recipes. I have looked for a while before I found your website and we tried the skillet fried plantains with cheese and took your advice of adding an egg, we don’t do fried but I did a poached egg and a few drizzles of sriracha sauce and it is now made at least once a month for my husband if not a couple of times. I’m sure I can at some point enjoy a whole month of making Plantain dishes. Would be nice to see a Plantain and Ice Cream dessert dish. Have you tried fried plantain with condensed milk. Makes for a delicious desert.